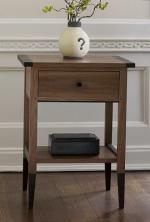 Thomas William Furniture’s joinery is mortise, tenon and pegged. Without a doubt, the mortise and tenon joint is used more than any other for woodwork and furniture. The mortise and tenon joint has been used for thousands of years by woodworkers around the world to join pieces of wood, mainly when the adjoining pieces connect at an angle of 90°. In its basic form it is both simple and strong. Although there are many joint variations, the basic mortise and tenon comprises two components: the mortise hole and the tenon tongue. 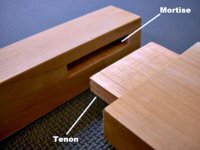 A tenon is the male component of a mortise and tenon joint, used to create an extremely strong and durable connection point. While there are a number of styles, the concept is basically the same: the end part of one material is inserted into a hole in another material. Generally, the tenon is made by narrowing a portion of the rail from which it is cut, creating a “shoulder” which determines how deep it may be inserted into the mortise. After insertion, the tenon may be glued, pinned, or left alone. A stub, or hidden, tenon is shorter than the width of the material into which it is inserted. This type is used when no evidence of the jointing method is desired. If the stub is tight enough, it can be held in place by friction alone. If not, it can be strengthened with glue or pins. Through tenons are longer than the width of the material being inserted into, and are visible. The joint can be pinned through the mortise, glued, or left alone. The exposed end can be pinned with a dowel. You can view a short video of Tom making tenon's by clicking here.